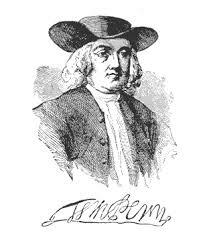 In 1681, William Penn specified that settlers coming to the lands granted to him by English King Charles II must preserve one acre of trees for every five acres cleared. In southeastern Pennsylvania, descendants of those settlers extended Penn's far-sighted conservation measures by establishing collections of trees. In the 1970s, the first residents of the Kendal and Crosslands communities joined in the arboretum-creating tradition that began in this area by Quakers John Bartram (Bartram Gardens), Minshall and Jacob Painter (Tyler Arboretum), Joshua and Samuel Peirce (Peirce's Park, the beginnings of Longwood Gardens), and carried on by other Quakers, including John Morris (Morris Arboretum), Arthur Hoyt Scott and the founders of Swarthmore College (Scott Arboretum), and Henry Cope (Awbury Arboretum). The Kendal at Longwood Community (KCC) was established in 1972 and the Crosslands Community opened in 1976. A non-public paved service road and a network of trails through two hundred acres of mature woodland link the arboretum's two sections. Trees stand among and around stone and brick farmhouses, barns, clusters of cottages, two-story apartment buildings, and the dining, fitness, and health centers of the two communities. The numbered and labeled trees on the Tree List are adjacent to or near paved, handicap accessible paths, and represent sixty-two different species. Suggested loop walks take visitors by numerous other trees, shrubs, small gardens, and alongside woodlands and meadows. Trees in the Kendal Crosslands Arboretum (KCA) are located on the landscaped areas in two of the four residential communities which comprise the Kendal Crosslands Communities (KCC). Given the large size of many trees on each campus, it is likely that these trees existed before the communities were established. With the goal to improve the balance between exotic and native species, a significant number of new trees have been added to each campus, including thirteen trees donated as memorial gifts during 2015. The trees are monitored and cared for by a committee made up of residents from both the Kendal and Crosslands communities as well as the KCC staff horticulturist and full-time Grounds Department. This KCA Joint Committee collaborates with the KCC grounds department and with the residents' Horticulture and Nature Conservancy groups on each of the two campuses. Separately and in combination, these committees sponsor Earth Day events, educational programs, service opportunities for area teenagers, and other forms of involvement for residents and visitors alike. Vegetable gardens, fruit tree and berry gardens, both resident and community perennial gardens, meadows and native plant areas, along with a diversity of trees, provide all who live here and those who visit close contact with a wide variety of plants, sweeping vistas, and the joys of relaxing in, caring for, and learning about the natural world.